The first frozen fruit confections on a stick (called the "Hokey Pokey") were sold as early as 1872. But it wasn't until 1923 that they became well known. That year a man named Frank Epperson applied for a patent on the first frozen fruit on a stick, called the "Epsicle". As with many inventions, the 'Epsicle' came about by accident. The story goes that Frank Epperson had made a glass of lemonade and, by chance, left the glass, with a spoon in it, on his windowsill overnight. It was a cold night, and next morning he discovered that the lemonade was frozen. To remove the frozen lemonade from the glass, he held on to the spoon and ran the glass under hot water. Looking at the frozen block of lemonade he decided he had invented something new. So he got a patent on his "Epsicle" which he eventually sold to the Joe Lowe Corporation who renamed the frozen fruit on a stick the "Popsicle". Making your own frozen fruit pops is quite easy as it only involves adding a sugar syrup and some fruit juice to a fruit puree (sauce) and then pouring this mixture into molds. Once the pops are frozen you will find they have an intense fruit flavor that rivals anything you can buy. You can use this recipe as a springboard for making various flavors of frozen fruit pops. For example, instead of strawberry (used in this recipe) you can make other purees from raspberries, blueberries and/or blackberries, to name a few. Once the sugar syrup has been added to the puree (and before adding the fruit juice) you could use this mixture not only for these pops, but also as a sauce to pour over ice cream or to add to sparkling water or wine. Use whatever fruit juice your family enjoys, whether that is apple juice, orange juice, pomegranante, lemonade or even limeade. 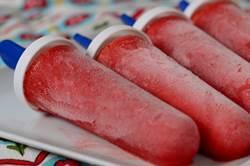 Frozen Strawberry Pops: Place the sugar and water in a small saucepan and bring to a boil. Let the mixture boil for about one minute or until the sugar dissolves. Remove from heat and let cool. The sugar syrup can be made, covered, and stored in the refrigerator for up to a week. Next, thaw the unsweetened frozen strawberries. Once thawed, place the strawberries in the bowl of your food processor or blender. Process the berries until they are pureed. In a large bowl, combine the sugar syrup, strawberry puree, and fruit juice. Pour the mixture into your molds and freeze for about 10-12 hours (or overnight) until frozen. Note: You can also make a strawberry puree from fresh strawberries. Simply place 1 pound (450 grams) fresh strawberries, cut into pieces, into your food processor and process until the strawberries are pureed.